Coach Roberto Mancini said Mario Balotelli’s performance was “pretty good”. 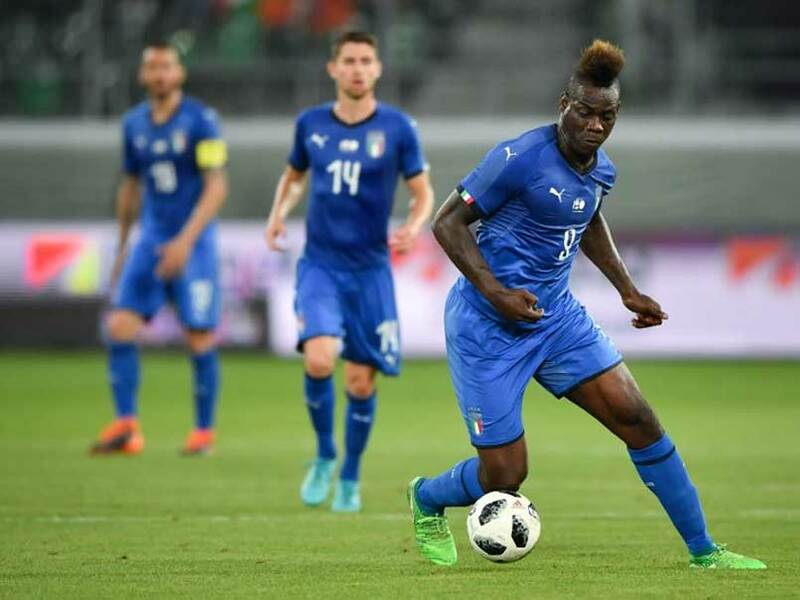 Mario Balotelli got new Italy coach Roberto Mancini off to a winning start by scoring the opener in a 2-1 win over Saudi Arabia in a pre-World Cup friendly in Saint Gallen on Monday. Saudi Arabia face hosts Russia in the opening match of the tournament on June 14 while four-time champions Italy stay home following their failure to qualify for the first time in 60 years. Made the scapegoat for Italy’s first-round exit from the 2014 World Cup, Balotelli’s four-year Azzurri hiatus ended when he was recalled by Mancini, appointed six months after Italy’s shock failure to qualify for Russia following a playoff defeat to Sweden. It took the 27-year-old Nice striker just 21 minutes to get on the scoreboard with his first goal for Italy since netting the winner against England at the 2014 World Cup. Substitute Andrea Belotti added a second midway through the second half before Yahya Al-Shehri pulled one back for the Saudis following Italian defensive blunders. “I’m satisfied with the first half-performance. The difficulties of the second half were down to tiredness due to the extra fitness training we’ve been doing over the last few days,” said Mancini. Mancini said Balotelli’s performance was “pretty good”. Italy have dropped to their lowest ever world ranking of 20th, but were in control against the 67th-ranked Saudis. Mancini opted for a 4-3-3 formation with Gianluigi Donnarumma in goal and Sassuolo winger Matteo Politano handed his full debut. Balotelli came out firing early with the Nice striker heading just wide off a Leonardo Bonucci cross. He finally found a way through with a low drive under the outstretched arms of Saudi goalkeeper Mohammed Al Owais for his 14th goal in 34 appearances. Napoli winger Lorenzo Insigne nearly added a second minutes later after picking up a pin perfect cross but defender Yasir Al Shahrani blocked. An Alessio Romagnoli bicycle kick flew just wide with Domenico Criscito rattling the the crossbar. Both Mancini and Saudi coach Juan Antonio Pizzi made substitutions in the second half with Balotelli making way for Belotti after 58 minutes. And the 24-year-old Torino striker scored the second when he turned in a rebound ten minutes later. Al-Shehri pulled Saudi Arabia back into the game four minutes later taking advantage of defensive error by Davide Zappacosta. Leganes winger Al-Shehri picked up a Salem Al Dawsari flick and fired past the outrushing Donnarumma into an empty net. After Donnarumma denied Fahad Al Muwallad a late equaliser Italy held on for their first win since their 1-0 World Cup qualifier away to Albania on October 9, which was followed by two draws and two defeats. Belotti added: “The failure to reach the World Cup is something that continues to hurt, it’s an open wound. Italy play two more friendlies, against France on June 1 in Nice and the Netherlands on June 4 in Turin. The Saudis play two more warm-up games, against Peru on June 3 and Germany on June 8 before kicking off their World Cup campaign.